Moldmakers and machine shops are constantly searching for ways to drive costs out of their manufacturing process. When they find a worthwhile technique that saves time and money, moldmakers are often reluctant to share their "secret" so they can maintain a competitive edge. However, here is an EDM technique that eliminates all benching time, while decreasing total cycle time by over 450%, diminishing scrap rates, and streamlines labor. The mold maker specializes in manufacturing speaker grilles for automobiles. A speaker grille mold contains thousands of intricate standing core pins to hollow out the plastic part. In this case, the mold cavity had 12,000 individual pin surfaces in a 1’ x 1.5’ area. Because the surrounding surfaces of the pins were so intricate and confined, it was impossible to give the mold a fine finish due to machine capability and bench polishing limitations. The mold builder used a conventional EDM machine and dielectric fluid to produce the mold. Each mold requiring about 150 hours burning the mold and up to another 100 in final finishing operations attempting to achieve a finer finish. Yet, they were only able to achieve a final finish as low as 12uRmax. Such a rough surface finish caused problems during the injection molding process. After the plastic injection cycle was completed, the final part was supposed to be ejected from the mold into a catch bin. But instead of ejecting from the press, the plastic grilles would stick to the mold, requiring a press operator to manually peel the still warm part from the cavity. Before the next shot could be processed, a mold release agent had to be applied to the mold cavity surface to aid in part release. Approximately 60% of the pieces peeled from the mold had to be scrapped because they were warped or distorted. Cycle time, secondary assembly, and finished part delivery times were adversely affected by these two manually intensive operations. Because the company used a conventional EDM process, it hit the proverbial "surface finish vs. surface area" wall, and was unable to improve the surface finish to allow for quality production and easy ejection of the part from the mold. The challenge was to find a solution to the problem that would enhance quality and finish, eliminate scrapped parts, and enable unassisted and automatic part release from the cavity. To do this, the company selected Makino Ram EDM machines with HQSF™ (High-Quality Surface Finish) technology, to first refinish the existing speaker grille molds, and then to make new ones. Ideally, moldmakers use the same EDM machine with single tank dielectric systems to both rough and finish molds, reducing manual intervention and cycle time, as well as machine maintenance. But in this first refinishing scenario, the existing mold had to be burned on a different machine with different dielectric fluid with a new set up of the part. This is much more difficult due to the attempt of matching a perfect set up with an exceptionally large cavity and electrode. To make matters more complicated, the tool was almost at net size. The initial challenge was to relocate the electrode precisely back into its original burn location. This was a tedious process because, although the size of the grille was 12" x 18", the total surface area burned was approximately 400 sq.-in. After it was repositioned, the electrode had to flawlessly burn no more than 0.0020" per side of the stock from the mold cavity in order to establish a consistent engagement to ultimately achieve a finer finish uniformly in all areas of the cavity. With proper setup and the assistance of Makino’s HQSF technology, the EDNC43S and EDNC65S were both able to finish the surface between 5 and 6uRmax in approximately 45 hours, requiring no bench polishing. Compared to the total of over 250 hours spent previously in an unsuccessful attempt of burning and polishing, this was a cycle time saving of over 450%. Because of the fine finish, the company had only to reset the ejection system on the injection mold machine. Parts were properly ejected without the help of a mold release agent and an operator did not have to intervene to remove a part from the cavity. Scrapped parts were eliminated and molding cycle time was reduced by about 30%. These results are attributed to Makino’s HQSF additive-based technology, micro SC. This environmentally safe powder is mixed with dielectric fluid to improve electrical conductivity for more consistent discharging. This increases the efficiency of the energy transfer from the electrode to the work piece, while secondary discharges that waste energy are eliminated, leading to a superior finish with an actual increase in metal removal rates. Although HQSF can benefit any EDM job in achieving high-quality surface finish, the largest differences occur when the surface area of the cavity is increased. This does not mean that HQSF is only ideal for large molds with little surface area, but the more electrode-to-steel surface area contact that is actually present, the more a cost saving benefit is achieved in producing a higher surface finish and in a reduced amount of total machining time. For example, the speaker grille cavity was 216 sq.-in., but the actual contact surface area was over 400 sq.-in. This additive is not alone in the world of additive-based EDMing and diffused discharge machining. Alternative solutions are silicone and chromium additives that compete on many levels. However, Makino’s additive, micro SC, reportedly offers several benefits over the alternatives. While Makino generally requires one gram of micro SC per liter of fluid, competitive solutions require at least 15 to 20 grams per liter. Gravity causes additives to sink to the bottom of the mold cavity, creating the need to add to the electrode’s undersize requirement. The gravitational settling of the heavier additives only allows the bottom surface areas of the cavity to be finished to an acceptable level. However, the vertical side walls of the cavity cannot be finished to the same acceptable level as the bottom floor. The heavier alternative solutions require at least 0.0070" per side electrode undersize, while Makino’s micro SC allows moldmakers to go as low as 0.00050" per side, enhancing burn accuracy and finished cavity detail. The settling of alternative additives also causes a loss of additive concentration that can not be recovered after a period of three to four days of operation. This "clotting" or "grouping" effect of the heavy metallic additives is largely due to a breakdown of the required surface agent that is used to keep these particles separated. 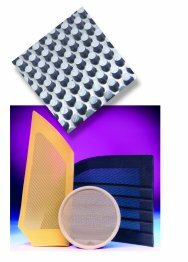 The heat from the EDM process breaks down the surface agents that are critical for additive separation. Makino’s micro SC particle does not require the use of these limiting surface agents for proper particle separation. One hundred percent of micro SC additive can be recovered even in a machine that sits idle over a period of time. The heat of the burn process does not affect the micro SC particle separation, permitting it to be effectively used for both roughing and finishing processes. The most important benefit of the Makino additive is that it can be used in a single tank dielectric system, allowing moldmakers to completely rough and finish a job in the same solution, completely unmanned. Alternative additives require a standard dielectric for roughing, and then an operator has to manually drain this standard oil and then transfer the additive dielectric that is stored in a separate reservoir into the machine for the final finishing operation. Micro SC allows moldmakers to use an automated process that reduces labor costs and cycle time, which drives costs out of manufacturing.